On January 25, members of the association carried out research on the Hoan-den in Jahana, Motobu. 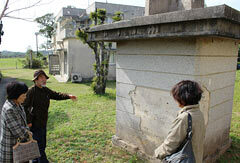 On January 25, Masami Shibata of the Osaka-based War Remains Research Association that is engaged in heritage work for war-related sites, researched the Hoan-den in Jahana, in the Motobu district, and then on January 29 visited a location in Tancha that was built to observe enemy aircraft. The association plans to request support from the central and prefectural governments to restore the post to how it was when it was first built. The association began to carry out research on the Hoan-den in 2008, and applied to the municipal government to designate it as Important Intangible Cultural Property. Recognizing its historical value, the municipal government did so in October 2010. On February 7, the association researched war-related sites in various parts of the prefecture, including the central and southern region of the main island of Okinawa.